Brad Anderson breaks out a 23-yard run against Bowling Green on September 23, 2017 in Murfreesboro, TN(Darwin Moore/MTSU Sidelines). In a game that saw six lead changes, the Middle Tennessee Blue Raiders (3-4, 1-2) lost in a shootout to the University of Alabama-Birmingham Blazers (4-2, 2-1) by a score of 25-23. It was MTSU’s first trip to Legion Field since 2014. 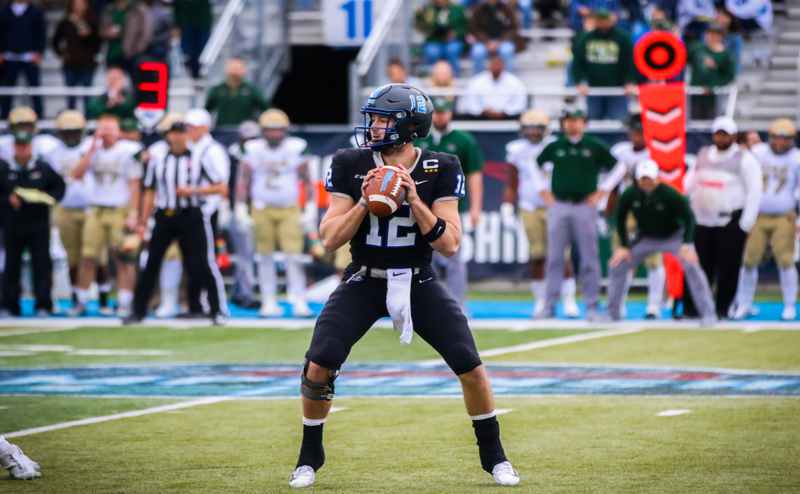 After forcing a UAB three-and-out on their first drive of the game, Middle Tennessee scored on their first chance when John Urzua found Brad Anderson on a seam route for a 27-yard touchdown pass to give MTSU a 7-0 lead. The Blazers struck back on the ensuing drive when running back Donnie Lee found pay dirt on a 23-yard touchdown run to knot things up at seven. After an unsportsmanlike conduct penalty on Desmond Anderson and a Lucas Hamilton hold, Middle Tennessee found themselves starting from their own three-yard line on their next drive. UAB took advantage of MTSU’s poor field position when linebacker Shaq Jones sacked Urzua in the end zone for a safety to give the Blazers their first lead of the game at 9-7. Middle Tennessee kicker Cannon Rooker set a new career-long with a 47-yard field goal to give Middle Tennessee a 10-9 lead at the end of the first quarter. The back-and-forth lead changes continued when UAB running back Spencer Brown’s eight-yard touchdown run gave the Blazers a 16-10 lead early in the second quarter. The Blue Raider special teams stepped in to give MTSU the lead back at 5:54 left in the second quarter when Ruben Garnett blocked a UAB punt, and Kylan Stribling picked it up and returned it 20 yards to make it a 17-16 game. Four plays later, UAB regained the lead when former Blue Raider A.J. Erdely found receiver Andre Wilson for a 19-yard touchdown pass to give UAB a 22-17 advantage. 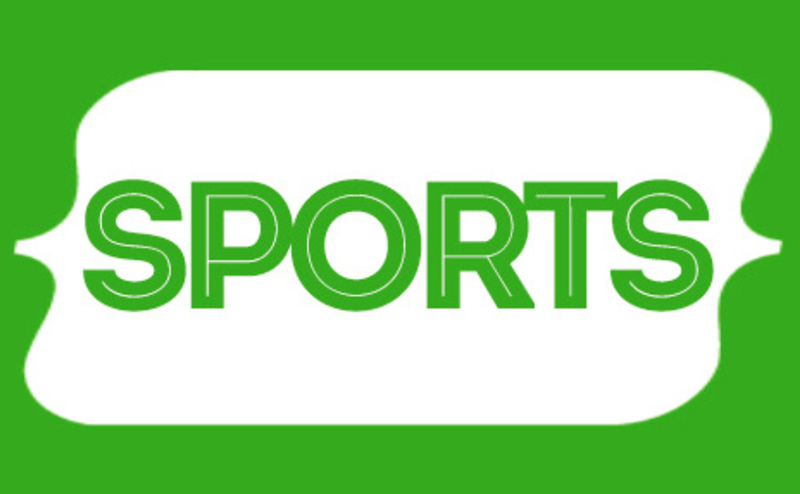 The Blazers two-point conversion try was stopped by MTSU. With time winding down in the second quarter, Rooker knocked one off of the goal post and through the uprights from 46 yards out to cut the UAB lead to 22-20, where the score ended up at halftime. Defense became the story of the second half after a high-scoring first half, as each squad only scored three points apiece for the rest of the game. Rooker knocked through his third field goal of the night from 40 yards or further to start the third quarter and give MTSU a 23-22 lead. Mike Minter picked off an Erdely pass at the beginning of the fourth quarter with UAB in the red zone to thwart the Blazer attempt to regain the lead. With 8:16 left in the game, UAB kicker Nick Vogel nailed a 33-yard field goal to swing the lead over to the Blazers at 25-23. With 3:00 remaining and one timeout left, Middle Tennessee took possession of the ball on their own 20-yard. Urzua threw an interception to UAB’s Broderick Thomas with 2:14 left and only one timeout remaining, but the MTSU defense stepped up and got the Raiders the ball back with 29 seconds left. The Middle Tennessee offense picked up 33 yards in three plays on their final drive, but were unable to stop the clock enough without any timeouts, and the Blazers hung on to win. 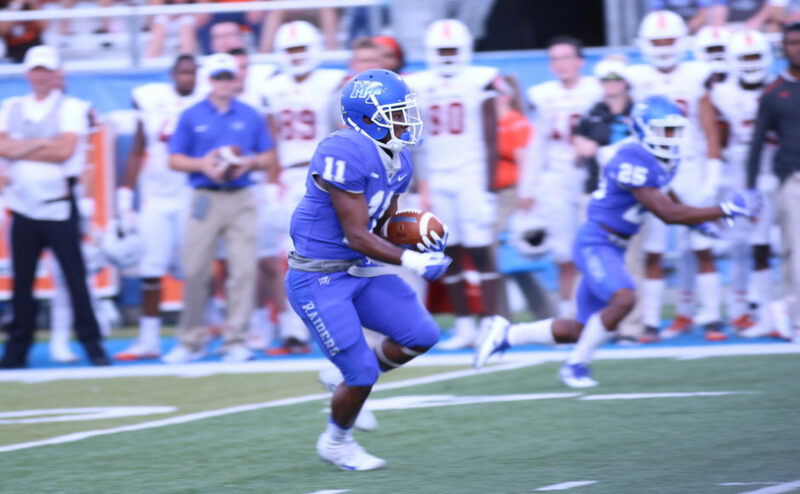 Middle Tennessee welcomed the return of prolific wide receiver Richie James against the Blazers, who missed the past three games with an ankle injury. James started at wide receiver, as well as at punt returner for Middle Tennessee. The Florida native finished the game with seven catches for 47 yards, while also returning two punts for 11 yards. James carried the ball three times for 16 yards. James also surpassed Kendall Newson for the school record in receptions when he made career grab number 239 in the fourth quarter. Freshman running back Brad Anderson continued his hot play against the Blazers. 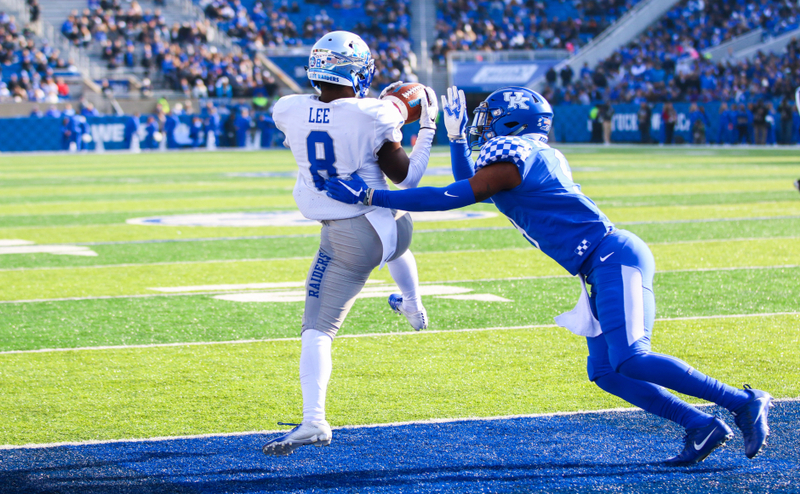 Aside from his 27-yard touchdown reception in the first quarter, Anderson caught eight more passes for 117 yards and was Middle Tennessee’s leading receiver. The Alabama native also led the Blue Raiders on the ground, toting the rock 15 times for 81 yards. Anderson’s 218 all-purpose yards and 117 receiving yards were both career-highs. 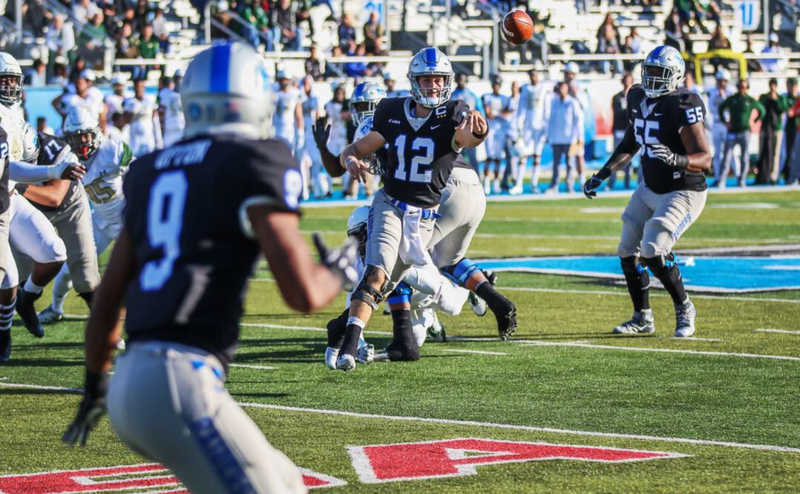 The Blue Raiders continued to have trouble in both the penalty and turnover departments, as they finished with 10 penalties for 88 yards and turned the ball over twice. UAB scored nine points off of two MTSU penalties. After forcing a fourth-down situation in the first quarter, a personal foul on linebacker Darius Harris kept the UAB drive alive, and they would eventually score a touchdown. A personal foul against Anderson and a hold on Hamilton resulted in the Blue Raider safety in the first quarter. 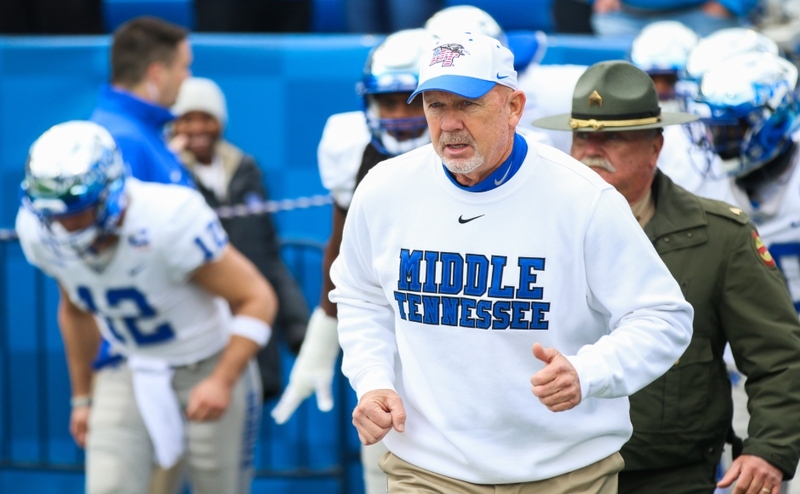 In the second quarter, MTSU drove the ball down inside the UAB 10-yard line, when Williams picked off an Urzua pass at the 2-yard line to deny Middle Tennessee any points. Urzua would be picked off again, this time down by two with 2:14 left in the game. Urzua was looking for Richie James and led him just a bit too far, and UAB cornerback Broderick Thomas secured the ball to give UAB possession late in the game. MTSU had only one timeout remaining when the defense took the field. The Blue Raiders return to Murfreesboro for a Friday night battle with the Marshall Thundering Herd. The annual blackout game is scheduled for a 6 p.m. kick-off.